2.5x Magnification is the most popular model. It offers the widest field of view and longest depth of focus. 3.0x is designed for dentists who need more magnification, giving you a good field of view and depth of focus. 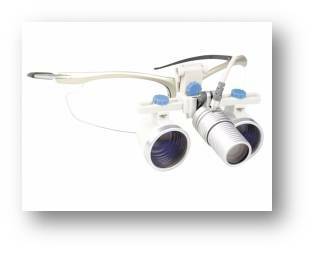 3.5x is the highest magnification available in Galilean Loupes, being suitable for specialist work within a smaller depth of view by giving you the ability to perform most dental procedures, such as cosmetic, crown and bridge, etc. Multi-coated, high grade glass lenses produce crisp, clear image. With the very large field of view, the depth of focus is deep and the object can be seen stereoscopically with actual distance feeling. Fatigue is minimized after prolonged use. Adjustable Viewing Angle: 0 to ~40°. Adjustable Pupil Distance: 45 - 80 mm.